With all the different types of air fryers and convection ovens out there, how can you choose one? They all appear to work the same, have the same desired effects, and are simple to use. While they do possess a lot of similarities, there are some key differences that set them apart. If you’re wondering how different they could be, this article is for you. Whether you decide to choose one over the one is all a matter of personal preference, but it is good to break down the advantages and disadvantages of each one. 1 How Does an Air Fryer Work? 2 How Does a NuWave Oven Work? 3 What Do Air Fryers and NuWave Ovens Have in Common? 4 How are Air Fryers and NuWave Ovens Different? An air fryer has an interesting way of working. It uses less oil or doesn’t require any oil at all, which is odd to think when you hear fryer. 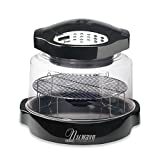 An air fryer generates very hot air at the set temperature, and then its fan will circulate the hot air around your food rapidly from all sides of the food, making it cooked evenly. The cooking temperatures can reach up to 200 degrees C, but it doesn’t burn off the nutrients. Some of the best air fryers such as Philips digital airfryer HD9230 and Philips XL airfryer HD9240 have a special pan with patented starfish design that helps air flow even better. There are different features you can choose from, including grilling, broiling, roasting, and baking. The built-in cooling system allows the temperatures to stay the same, and air is transferred to the exhaust. Most air fryers have an auto shutoff, and they can cook the food quickly. One of the primary functions of an air fryer to keep food healthy, which can be difficult in today’s world. How Does a NuWave Oven Work? A NuWave oven works with different functions. This includes infrared, conduction, and convection cooking, which gives you more options to cook. It doesn’t need to preheat, and will cook frozen food right out of the freezer. There are different settings you can choose from for baking, broiling, steaming, dehydrating, air frying, barbecuing, and roasting. The NuWave was designed to lock in the nutrients in your food, while collecting the fat and grease from your food. It cooks quickly and is easy to clean. A NuWave oven will save you time and money. Check out our NuWave Oven Reviews for more information about its pros and cons and whether it is safe for your health. What Do Air Fryers and NuWave Ovens Have in Common? Now that you know how each unit works, and what you can do with them, now it’s time to see how they compare to each other. Here is what they have in common. No matter what you want to cook, you can choose a variety of settings for the type of meal you want to prepare. The selection settings of both units make cooking easy and quick. No matter how you choose the use the unit, you can be sure it is easy to learn. You can adjust the settings to your preference, place your food inside, and wait a few minutes. Cleaning is the worst part of cooking, and since you can put most of the parts in the dishwasher, you can cut down on your cleaning time. For the parts that can’t go in the dishwasher, you can take a towel, soap, and hot water and wipe it off. Since both units don’t require a lot of energy. Since they don’t use up a lot of energy, you will save money and more importantly, time. It’s always nice to have an appliance that helps you out. Both units are safe to use, since they have auto shutoff’s and timers. Even if you burn something, if you forget about your food, you won’t burn down your home. That’s always a nice feeling. Counter space can come at a premium, so it’s important to use it wisely. Both units allow you to save space where you need it. However, if you have a lot space or are looking for an oil-less fryer to fry a turkey, Char-Broil The Big Easy TRU-Infrared Oil-Less Turkey Fryer is more suitable for you. Both units are nice to look at, so you don’t need to feel embarrassed when people see them. They might actually be quite impressed! How are Air Fryers and NuWave Ovens Different? Of course, there are going to be differences between the two units. Here are some things that set them apart. The Nuwave is going to have a larger basket capacity that comes in handy when you’re preparing larger meals. NuWave 20632 Pro Plus Oven with Stainless Steel Extender Ring even allows you to increase basket height by 3 inches so you can cook up to a 16 lb. turkey or 14 lb. ham. For those with larger families, you will need to cook in batches with the regular size air fryer or buy an XL air fryer such as Philips XL airfryer HD9240 or Air Fryer XL by Cozyna. The air fryer is going to be more durable than the Nuwave. The Nuwave does have some parts that will need to be changed out to offer a longer life. Even though both units come with cookbooks, you will get more with the Nuwave. An instructional DVD is included with the Nuwave, allowing you to have a more immersive cooking experience. Both units are excellent choices, and depending on how you’re going to use them, you may be better off with one over the other. It seems that the biggest difference is the personal preference of those that use it. Either unit will work for your needs.